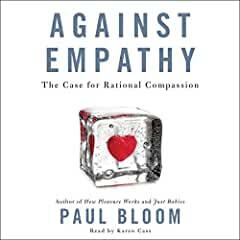 Paul Bloom makes a strong case against the use of empathy as a way to conduct our moral lives, although as several reviewers such as Constantine Sandis, have already pointed out, there is some ambiguity about what he means by it, and arguably he has defined it so narrowly that his thesis is less interesting than it sounds. He focuses on emotional empathy, where one feels the emotions that other people feel. He also includes cognitive empathy, which is directly relating to their cognitive states such as beliefs and desires, although it's not clear exactly what that means. To cognitively empathize with you, do I need to want what you want and believe what you believe? Bloom's main point makes a lot of sense. We should base our decisions on facts and rationality, not arbitrary emotions. He gives plenty of examples where being pushed by empathetic feelings will lead to unfair results. He also points out that empathy can lead to burnout for the empathizer, and so their ability to act morally will be limited if the only way they do it is through empathizing. His recommendation is that we should avoid empathy and use compassion and kindness instead. Kindness only requires seeing a problem and making an effort to help, and does not require that one feel the pain of another person. Compassion means understanding someone's situation and their suffering, but not feeling it oneself. It is possible to remain compassionate and kind without burnout, and one's actions will be less driven by arbitrary factors that lead to unfair outcomes. It is commonly claimed that it is impossible to understand someone else's experiences unless one has experienced them oneself. The concept of empathizing that Bloom is combatting feeds into that idea, suggesting that one can understand other people's experience by directly feeling what they feel. All of this neglects the power of human imagination, which fuels literature and memoir. We can understand someone else's experience though their descriptions and using our imagination. These enable us to understand the lives of people even when they are extremely different from ours and we have no directly comparable experience. Bloom himself says little about the power of the human imagination, and this is a gap in the book, especially since it would help his case. We can understand the plight of others though our imagination, and this is part of an enquiring compassionate attitude to others. Some cases of extremely vivid imaginations may be like cases of directly feeling someone else's feelings, but generally using one's imagination helps keep the feelings at a distance and does not drain one's emotional resources. This use of one's imagination can help our moral decision-making in setting our priorities and also just in engaging with others. Most of us want those close to us to understand how we feel, but that does not mean we want them to feel what we feel. In sum, Against Empathy is well written and instructive, surveying much of the literature on empathy and showing that most of the claims for the importance of empathy in a good life are overblown and implausible. It's an important contribution to the popular psychology literature. It's a bit of a mystery why the audiobook is performed by a British woman, Karen Cass, when Paul Bloom is an American male. Maybe it is trying to show that you don't need to empathize with an author in order to understand their book. It's a little bit jarring when she refers to herself as male and having the first name of Paul, but she does a good job.